Asus were among the very first to offer stand alone Windows tablets paired with matching docking stations with their Transformer Books. 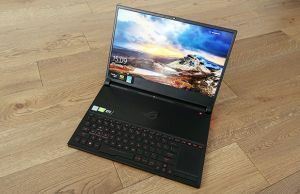 In the meantime, this has grown to become one of the most popular 2-in-1 form-factor available these days and while other manufacturers released similar devices, Asus did not lie on their back and waited. As a result, they just recently announced the T100TAM and the T200TA Transformer Books and I’ve spent some time with both of them in the last few weeks. These are not ultrabooks, but rather affordable hybrids, with a starting price of under $400. For that kind of money you’ll be getting Windows 8.1 slates built on Intel BayTrail-T low-power hardware, a platform meant to be primarily efficient, while coping fine with everyday basic tasks. So performance is not their strong-suite, there are other hybrids to look at if you need that. 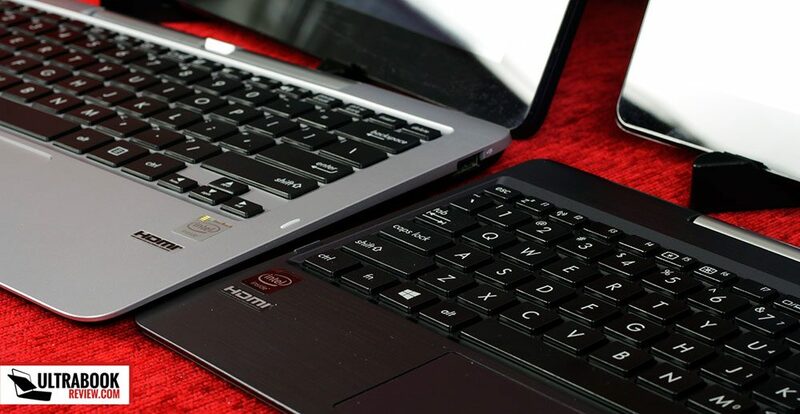 However, these Transformer Books sure offer a lot for the money and if you’re looking for inexpensive mini-laptops that can handle more than just the fun, you should have them on your shortlist. The full reviews of these two Transformer Books are available on my other website, TLBHD.com, where I cover tablets and affordable ultraportables. You’ll find the exact links below. But first, let me tell you a few things about these two. 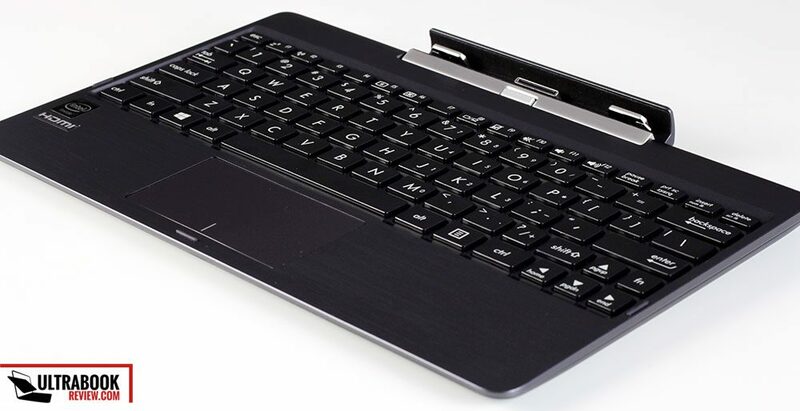 This one is the updated version of the popular T100TA, a compact 10.1 inch 2-in-1. The tablet itself is now covered in metal, while the older version was entirely made of plastic. That allows it to look and feel more premium, but at the same time adds to its total weight, as the T100TAM model tips the scales at about 1.33 pounds, while the plastic TA weighs only 1.25 lbs. This aside, not much has changed, at least not on a first look. The new 10 inch Transformer Book still packs the same ports and buttons as last year’s model, positioned in the exact same spots, and still offers a touchscreen with 1366 x 768 px resolution. However, Asus replaced the panel with a slightly improved one, capable of delivering more accurate colors, according to my tools. But you’ll hardly see that with the bear eye, even when having the two side by side. Even so, if you need color accuracy on your device, you’d be glad to know the TAM delivers an improvement. The other major change is the hardware inside. Still part of the Intel BayTrail-T platform, the Z3775 CPU is slightly higher clocked than the Z3740 CPU used on the original T100 and bundles slightly faster graphics. And while on paper these might not seem much, every little bit counts on a low-power device like this one. Paired with 2 GB of RAM and eMMC storage (although a slow flash when compared to what we get on ultrabooks), the T100TAM Transformer Book can deliver a solid experience as long as you don’t push it. Browsing between up to 10 tabs while occasionally listening to music, editing texts or watching some clips on Youtube goes smoothly. The tablet can also handle older Windows games and even photo/video editing software, as long as you stick with minor tasks, plus all the apps in the Windows Store. 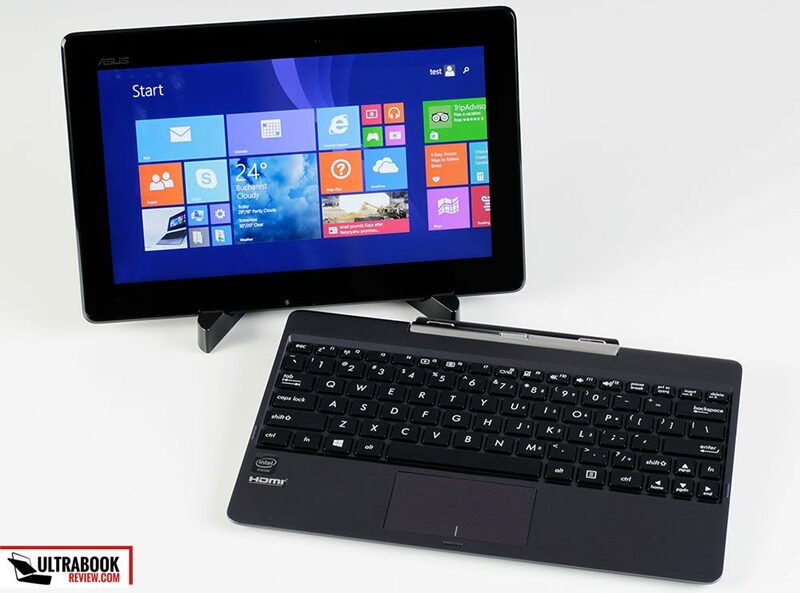 The tablet comes with a docking station and that’s what really make it more versatile than a regular slate could be. 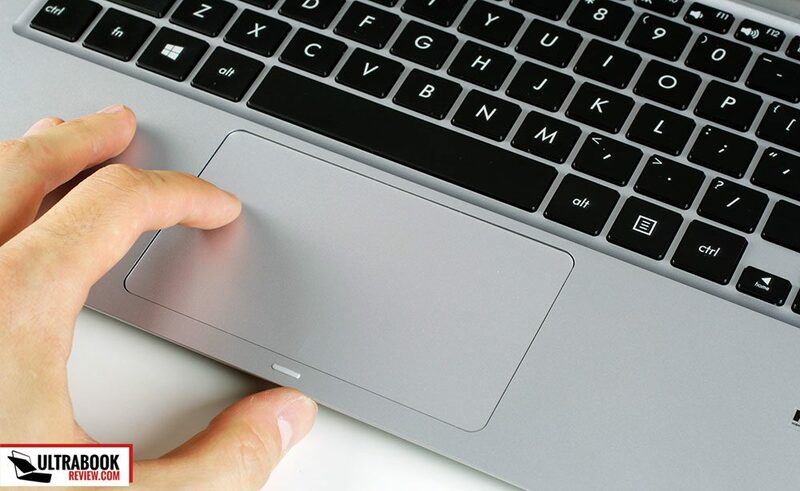 The dock includes a keyboard (with rather small and cramped keys, but that’s what you can get in this size class), a trackpad (again, tiny, but it will do the job if precision is needed), an USB 3.0 port (for peripherals) and an extra 2.5″ storage bay inside (some models come with a 500 GB HDD included, but you can put your own solution in there, preferably an SSD, to keep this noise-free). Speaking of noise, the Atom platform inside the T100TAM is fanless, and that makes the whole thing virtually silent. It’s also efficient, I will say that again, which allows the device to run cool most of the time (the back gets somewhat warm under load) and deliver roughly 8 hours of daily use on a single charge of the 31 Wh battery (placed inside the tablet, there’s no battery in the dock). Too bad this battery takes forever to charge, as charging is done via the microUSB port, something I’ve also complained about when I’ve reviewed the original Transformer Book T100TA. 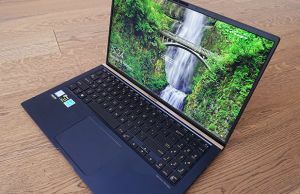 To sum these up, the Transformer Book T100TAM is only a marginal update of last year’s model, as you can find from the detailed review available over here. The metallic body, the slightly faster hardware and the marginally improved screen are its differentiators, so if you are looking for such a compact device right now, the TAM might be worth getting over the TA. But if you already own the T100TA, there’s little to no reasons to upgrade. 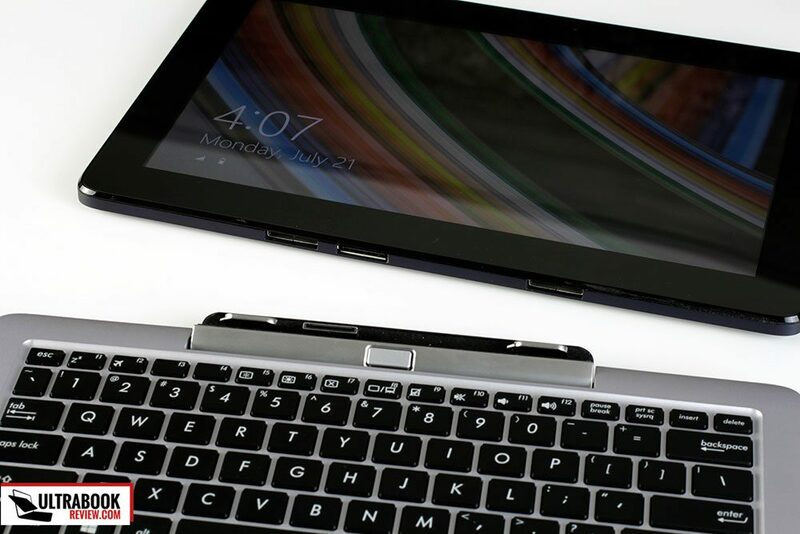 The T200 is a brand new device, the first Transformer Book with an 11.6 inch screen. It’s just as affordable as the 10 inch version, selling for $399 and up, although its base version comes with 32 GB of storage space, while the base T100 offers 64 GB. Regardless, the T200TA is larger than the T100 and heavier as well. 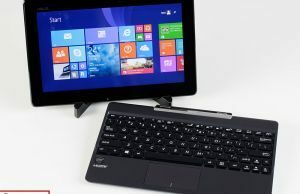 The tablet alone weighs around 1.7 pounds, and when connected to the dock, the entire ensemble tips the scales at 3.6 pounds, that’s with a HDD included in the dock. Because of the larger screen and much thicker bezel around it, the T200 has a bigger footprint than the T100, or in other words, Asus did have to sacrifice the portability of this device in order to get it in stores as cheap as they did. In comparison, they also offer a metal-made T300 with a 13.3 inch display and a 50 Wh battery, which is just as heavy as this 11 incher, but way more expensive. 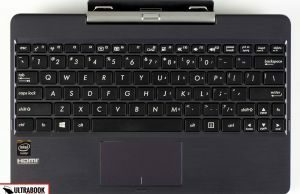 On the other hand, the T200 packs a much roomier dock than the T100 does, with a full-size keyboard (similar to the one on the Vivobook X202), a spacious trackpad and palm-rest, plus more ports around the sides (2 USBs and LAN). And all these, but also the fact that all the connectors on the slate itself are placed on the left-edge, make this device way more practical and comfortable to use in laptop mode. Hardware and specs wise, the T200TA is almost identical to the T100 mentioned above. 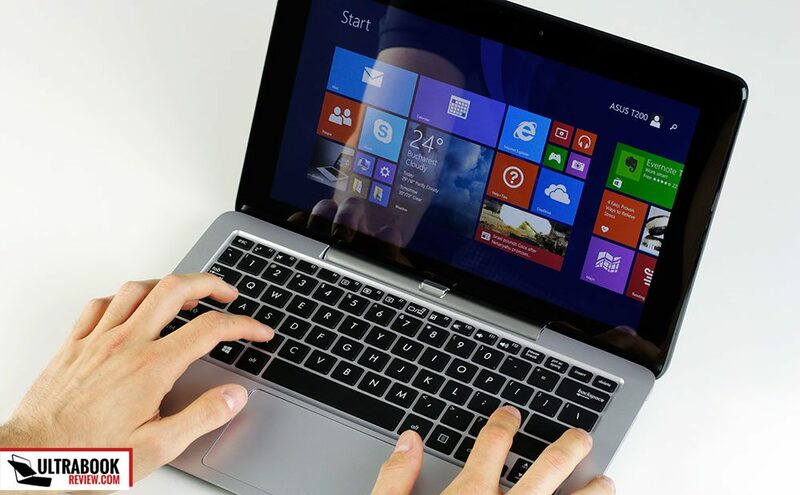 It’s powered by an Intel Atom Z3775 processor with 2 GB of RAM, packs an HD touchscreen with an IPS panel, bundles a reliable Broadcom Wi-Fi module and a large 37 Wh battery, larger than the one on the 10 inch Transformer Book, which translates in 8-9 hours of daily use on a charge, and that’s definitely not bad at all. On top of that, the T200 charges via a dedicated pin, so it does it much faster and can be comfortably used during this time, unlike the T100. 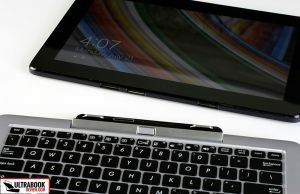 Long story short, the Asus Transformer Book T200TA is overall the better 2-in-1 of the two, while the T100 remains the better slate, as it is smaller and lighter. The detailed review will tell you more about it, so make sure to check it out. Update: The 32 GB storage / 2 GB RAM model is now available in a few different countries, but in the US it seems to be a BestBuy exclusive and sells for $399 (or 399E in Europe). 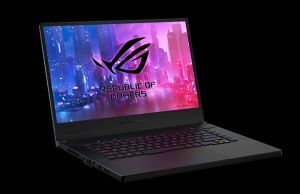 Most of the other big US webstores though, including Amazon or Newegg, list a $499 version of the T200TA, with a faster Intel Z3795 processor, 4 GB of RAM, 64 GB of storage and Windows 8.1 64-bit. That’s $100 on top of the base model, but the extras are probably worth it. The increased amount of storage will come in handy and the faster CPU and more RAM will boost the device’s everyday performance and multitasking abilities. The video below pitches the two Transformer Books one against the other and shows you their main differences and similarities. This post does the same thing, but gets more in depth. An 11.6 inch Transformer Book has been long awaited. Some of you complained about the fact that the T100 TA is actually too small to allow you to properly get things done and I’m inclined to agree. A 10 inch slate is properly sized for home-entertainment, but if that’s what you need, a Windows tablet is probably not going to be your main pick anyway. An 11.6 inch screen though is larger, large enough to see what you’re doing on it, while still keeping the device fairly portable. 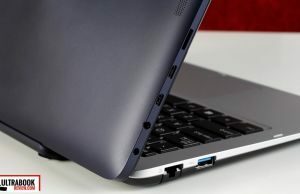 And with the larger footprint, there’s room for a decent keyboard and trackpad, plus all the others inside the T200 (more ports, bigger battery). Of course, the T200 is rather heavy and big for an 11 incher and that might steer some of you away, but it compensates with its aggressive price and that’s why this thing really hits a nice sweet-spot. Of course, both these Transformer Books have worthy rivals, some better built, better looking or with extra features. But pretty much all them are more expensive than these are. 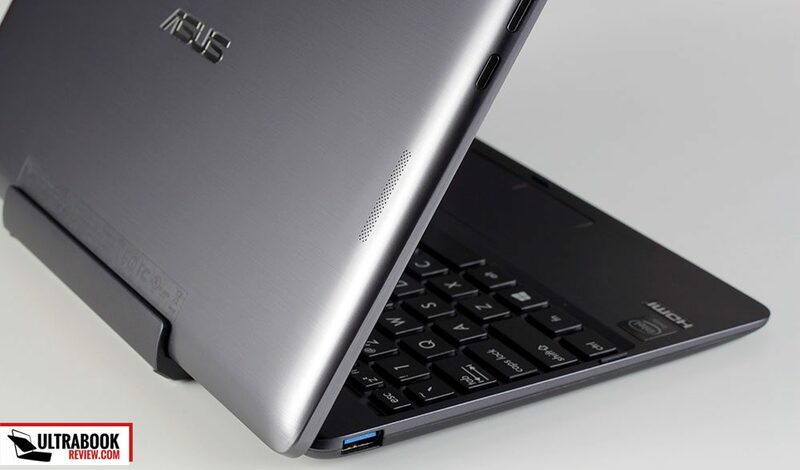 So if you’re on a tight budget and after a compact 2-in-1, the Asus machines have to be on your list. 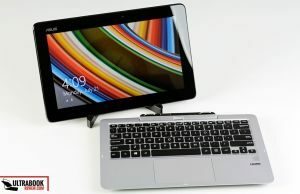 I do advise you to check out the competition as well, like the Acer Aspire Switch 10, HP Omni 10 or the Dell Venue Pro 11, and also my curated lists of compact ultraportables and more affordable ultrabooks alternatives. Last but not least, if you need a small computer for light activities, then you should also check out the available Chromebooks that sell for as low as $199 these days. To wrap this up, there are plenty of aspects you’ll like about the two Transformer Books mentioned in the post, but each has its particularities and each is better suited for certain activities/users. So in the end the choice is entirely yours, as you know better than anyone what you want from your computer and which details matter more to you than others. The comments section is open though, so if you have any questions or anything to add to this comparison, feel free to do it, I’ll be around to reply. Do the Asus t200ta 64gb model have necessary connectors in the dock for adding a HDD or SSD? Are you certain about that? I’ve seen people complaining online about compatibility issues between HDD and non-HDD keyboards with the tablet on prior models, as well as there being a difference in construction (HHD keyboards are apparently slightly thicker on prior models in the series). Nice review. There seems to rarely be mention about whether these ultrabooks/tablets have GPS or cellular data (LTE/3G). I use maps, email, internet, cloud,etc when I travel much more through cell data than wireless, so these are really important features. ASUS website (which is horrible, so I also talked and chatted with them), retailer website, cannot tell me if these features are available. One of the many ASUS websites (that I can no longer find) did say the t200 did have these features. Any info? There’s GPS, but no Celullar Modems on the version I tested. I believe I’ve heard something about a cellular option of the T200TA, but I can’t say for sure it will be available, where and when. I ended up purchasing the T200TA from a site on Amazon. The seller is actually from Canada, so not sure if you can get these yet in the US. They do appear to have GPS, but no cellular option yet, although the ASUS website said at one point, that this would be an option. Probably because it’s new and not yet officially in the US. I expect the price to drop once Amazon, BestBuy and other stores actually start selling it. 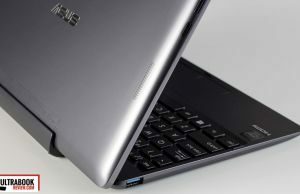 Does the new asus t100 version have a GPS module? The previous one didn’t have. Thanks. 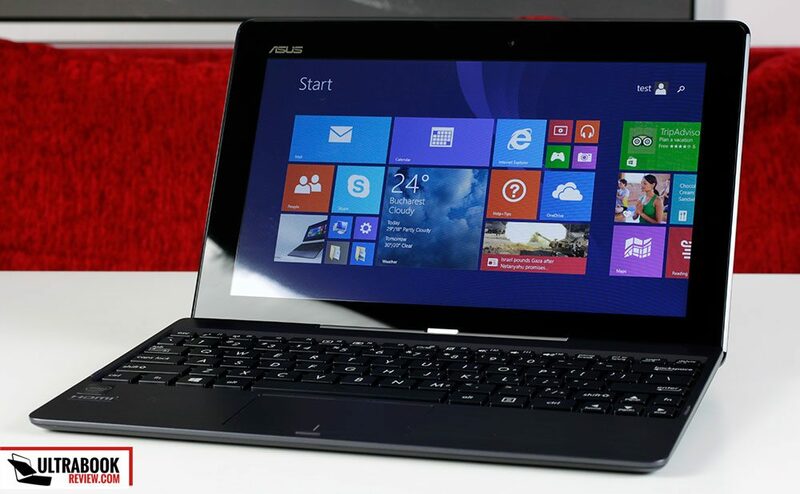 One more question: does the new asus t100 have widi or miracast capabilities? I’ve been looking it up on the internet and I’m afraid it doesn’t have a GPS module. Gps and 4g lte connection – it is what this device must hava. Without this both item ..people want buy it. It could be as option in higher price. Hello, I’m doubting between the 100 and 200. Mostly I use my laptops for holidays to store al my digital pictures. I have now USB 2.0 on my old laptop and it’s taking a lot of time every evening on my holidays to upload my pictures, so I was searching for again a light LT but with USB 3.0. Normally, I connect every evening a cardreader (old one USB 2.0, I have to buy USB 3.0 of course)and load my pictures on the laptop. After that I connect 2 EHD’s (old ones again USB 2.0, also have to buy USB 3.0) and load the pictures from my LT simultanously to the EHD’s. For that I have to buy a USB 3.0 hub because there’s one connection USB 3.0. Does anybody know which of the two, T100 or T200 should be better for that purpose? Hi Frank. Doesn’t your camera use SD cards? 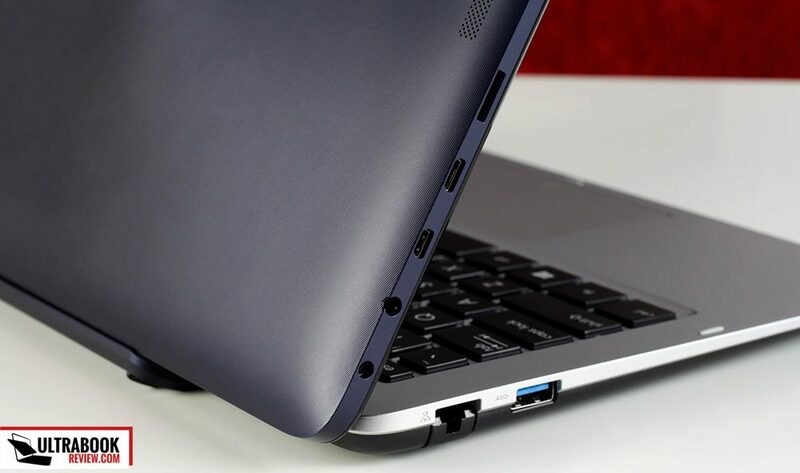 If yes, then you’d be better with a solution that offers both an SD card-reader and an USB 3.0 slot. This way you can pop out the card, stick in the card-reader, stick the EHD into the USB 3.0 slot and copy directly from the card to the EHD. It’s going to be quite fast. If you really want any of these though, I’d get the T200, stick the card-reader into the USB 2.0 slot (the one you already have), stick the EHD into the USB 3.0 slot and the copy the files directly from the card to the eHD. With the T100 that’s not an option. Hi Andrei, thanks for your reaction. I’m using only CF cards. I understand that both LT’s can be bought with 500GB disk? When I upload my pictures from that disk to both EHD’s the same time, isn’t that to heavy for the LT’s? Ah, I see. No, copying straight from the card to the external HDD shouldn’t be something the T200 won’t be able to handle. But copying to two different sources at the same time might be somewhat slow. Can’t say for sure, you’d have to try it out. And yes, both come with 500 GB HDDs in the dock. However, keepo in mind that on the T100 you will need to buy the version with the HDD included from starters, the version without uses a different dock that can’t fit the storage drive. With the T200, you can buy it without if you want to and the put a 2.5″ 7mm drive in yourself. Hi, interested in the t200ta and wondered if you could help. In the UK only the 32 gb version (in the tablet) appears to be available. I have read that windows 8.1 uses up around 27 gb of space; does that mean there’s only 5 gb left on the tablet? Is the sd card slot on the tablet or the docking station? Presumably it would be better on the tablet side of things as it would enable one to increase the memory from the small 32 gb. Thanks for review and any assistance. The 32 GB version with just Windows installed leaves you about 14 GB of free space. In time though the Windows install gets bigger due to updates, etc. 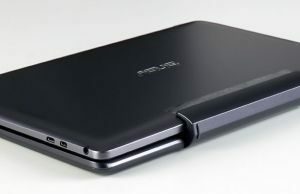 The microSD card-slot is placed in the tablet and it can be used to expand the storage space. My advice: make sure you buy the fastest microSD card you can afford. You can also place a HDD inside the dock if you need even more space. But that one you’ll only be able to use when having the tablet and the dock latched together. Thanks Andrei, that was a great help. I’ve ordered one with 500 gb hdd and will get a 64gb samsung evo micro sd. T100 should come with Office Home and Student. T200 however only comes with 1 year of Office 365 Personal, you’d have to pay afterwards. Hi Andrei, how well does the 200 run iTunes? I’m thinking of getting one for my wife…she browses, uses office and iTunes. I don’t use itunes myself so wouldn’t know. It should do alright. I haven’t tried it, but iTunes is not very demanding. The most needy activity would be running 1080p movies and this 2-in-1 can handle it. Hi! I’m very interested in the T200 but only the 2GB RAM version is being offered here in the Philippines. Is the RAM upgradable? Thanks ahead! Check out the detailed review, those should answer all your questions on the T200 and T100. Can anyone tell me if the keyboard dock will charge the tablet when docked? There’s no battery in the keyboard dock, so the answer is NO. I’m at a crossroads between the T100TAM and the T200TA. I’m mostly leaning towards the T200TA because of the better keyboard and 4GB of Ram, but have strong concerns about battery life of the device and the weight and size in tablet mode. I plan to use the Transformer Book as a laptop and tablet equally. I have never owned a detachable 2-in-1 before. In your opinion, would the battery life and the size/weight in tablet mode be dealbreakers to you, or are the differences negligible? Hi, sry for the late reply. The battery life shouldn’t be a problem. However, the size and weight should. 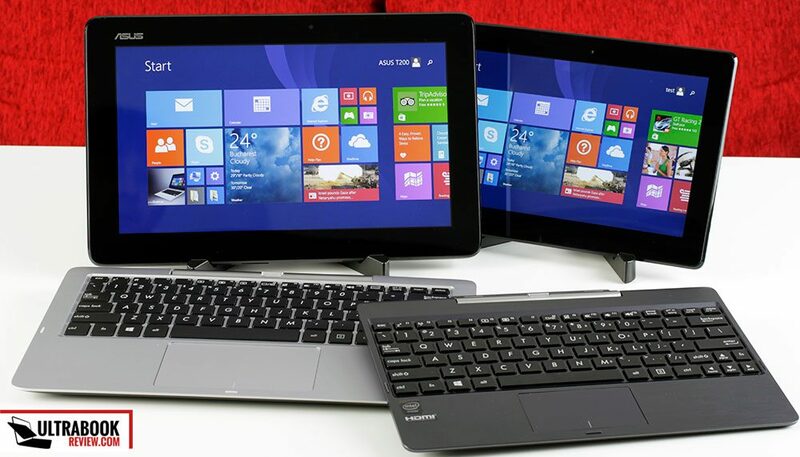 As mentioned in the review, the T200 is rather bulky and large (check out those bezels) for an 11 inch tablet. Its footprint (length, width) is closer to that T900 than to the iPad. The thickness is decent though. just bpught the t200ta…excellent…just wanted to knpw whats the max size micro sd card this pc can support?? been searching all over and still not sure. 64 gigs from what I know. Thanks for the excellent review and the answers to the many questions! I’ve just ordered a T200TA-C1. I will now begin looking for a SSD or hybrid-HDD. There is no point in buying a drive with higher specifications than the T200 is able to utilize, so what specifications should I be looking for when shopping for a drive for this T200? Thanks! I have the 32 bit version with 2gb of ram and I want to exchange for the 64 bit version with two gb ram. My question is whether the ram on the 64 bit version is upgradeable or is it the same as the 32 bit version? Do I have to buy it with the amount of ram I want already installed? I noticed there are 2gb and 4 gb versions for sale with the 64 bit OS. I wonder where the GPS is. Your page is the only one that mentions it has a GPS module. I bought the T100TAM, and I can’t find the GPS. 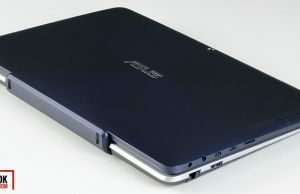 No note of it in the manual, not anywhere on the system, not on ASUS page. If you had tested it, where did you switch the GPS on? Hmmm, that was a mistake on my part. There seems to be no GPS on these units, sry for the confusion. 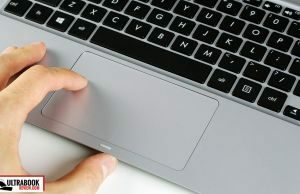 Hi Andrei, is the dock keyboard LED-illuminated? Can I use T200TA to sync my iphone 6 thru Itune with USB slot on T200TA dock ? Can these be upgraded to windows 10 when it comes out ? Ceva se mai aude cu versiunea LTE 4G, am contactat recent asus, nici nu mi-au raspuns? Tu stii ceva Andrei? I haven’t heard anything about those so it’s probably safe to assume they’re not coming to Europe. Hi! Thanks for all these information. My question is will the 64GB version with 500 GB storage in the dock be released or will it be available in the Philippines? Thanks! I have buy ASUS T100TAM on my device there was not have GPS but only location sensor using Wifi..
(1) Can i replace the 500GB in the dock with a new SSD? If yes, how about the spec to be compatible? Yes, any 2.5 inch 7 mm SSD should work just fine. Go on Amazon and research which have thew best reviews. Samsung and Intel SSDs are what I’m using on my devices, but others have nice offers as well. is there any one here experience like mine, asus t200ta-cp004h bleeding issue at the screen during booting operating system. 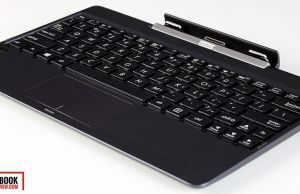 Will the Asus T100TAM be offered in the Philippines? As of the present only the T100 TA in Gray, white and red are available in the Philippines. However, I would like to buy the metal version which is not curently being offered in the Philippines. Do you have any idea or do you have a contact person who can answer whether the Asus T100TAM shall be offered in the Philippines. Thanks! Hi I am using t200ta and noticed that if I connect a USB mouse with the doc its not working. How to solve the problem? Hi can I charge my T200TA with micro USB port like T100? Please answer in English. Can I use a wireless mouse with this unit? I bought a T100TA a few months ago with the dock that has the 500GB HDD and I love it but I have just noticed that all the files i have saved so far have been saved to the tablet memory. Ii can’t find any instructions on the machine or online on how to save files to the HDD instead. I’m not techy at all so I’d be grateful for any pointers you could give? Thank you. YOu cna choose where to save the files from any of your programs. Use Save As and navigate to the HDD and save them there. I have bought a T100 a few days ago and upgraded it to windows-10. But the mouse-pointer doesn’t show up on the screen and the keyboard on the Dock doesn’t work. but the touchscreen works perfect. i keep the bluetooth on while the tablet is attached to the Dock. Can you help ? I have a T200TA. The edge of the tablet is sharp and uncomfortable to hold. That said, I am now more interested in the tablet stand used to display the tablets in this articles photos. Can you let me know where I can buy one? Thanks, Tommy. 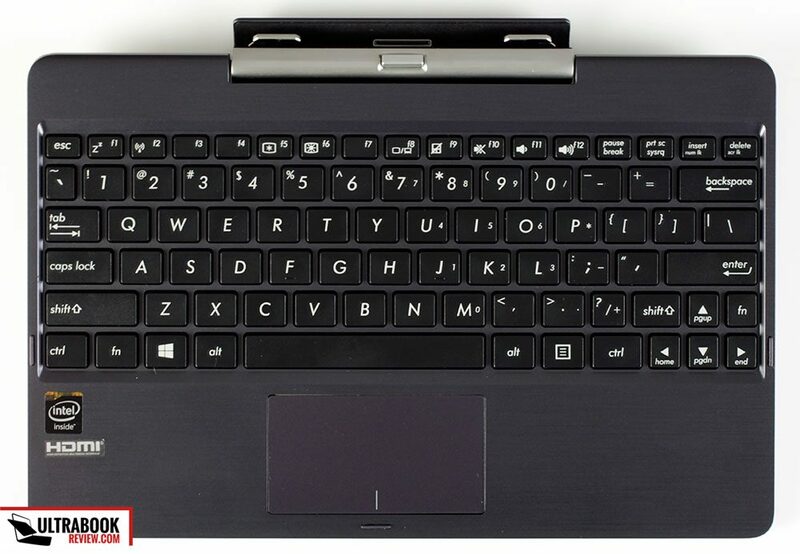 I bought ASUS Transformer T100TAM 32gb emmc with keyboard dock, I just wondering cause I have no idea if the keyboard dock have a slot space for hdd/sdd? your reply is much appreciated. thanks for your swift reply, i open up the keyboard dock there’s no slot/ port to connect for hdd/ssd.. i am thinking now to trade in /swap / sell this t100tam.